Sure, cheese has protein, but when it comes to fueling your gains, more is better. Add some extra pow to your diet with this delicious, protein-rich cheese bake! When you see this recipe's ingredient list, you may wonder, "Why?" Why bother adding pea-protein powder to a cauliflower cheese bake? Why pea protein anyway? Why not just serve cauliflower smothered in cheese and wash it down with a protein shake or add a side of steak if protein gains are what you're after? You might even think, "This ain't for me," or "This Anna Sward woman, she's pushing it with this one." You know what I say to all of that? I say you're right. I am. I am pushing it—the envelope that is! I'm pushing the boundaries of innovation when it comes to protein-powered cooking, and I strongly recommend you do, too. This cauliflower cheese bake will change the way you think of pea-protein powder. Maybe you've shied away from it in the past, or been afraid to touch the stuff. No longer. Why? Because this recipe is delicious, it's simple, and nutritionally speaking, it's superb. 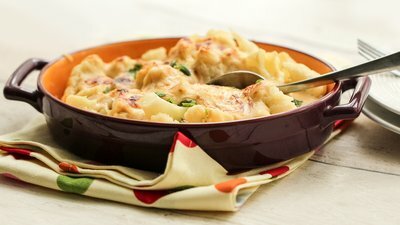 This cauliflower cheese bake ticks all boxes. It delivers a hefty punch of protein while satisfying everyone's seemingly insatiable love of creamy cheesy bakes. It's low-carb, gluten-free, and one of the most delicious savory dishes you can make with protein powder. This is the kind of dish that will make you fall in love with pea-protein powder, especially if you were originally skeptical. So whip this dish up, grab a fork, and dive into the cheesy, protein-packed goodness.